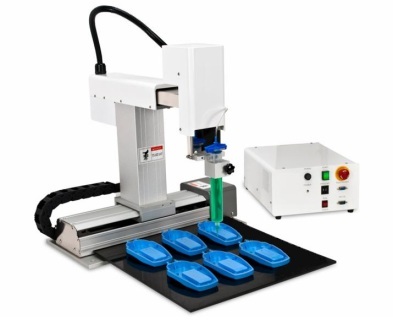 The cost of dispensing robots has steadily declined, until it has become an affordable, common addition to production in companies large and small. Virtually any assembly application can be automated. With the right shot meter, valve or syringe based system IntelliSpense™ Brand accessories and you can be up and running in no time. Teach pendants or windows based software programs simplify set up. 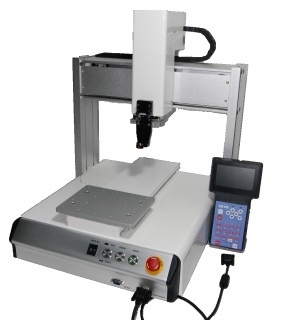 We offer a range of sizes for desktop use, offering rotary tables, 3 axis, 4 axis and 5 axis systems. These are great starting points, but sometimes customers need to add one of our bulk valve based systems. Contact IDS to discuss your application and make sure you are getting everything you need. 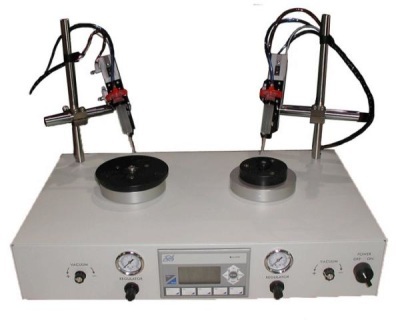 Includes the 5552200 - Dispensing Robot - Micro stepping 3-Phase motor, Analog pneumatic syringe dispenser that works with 30cc or 55cc pneumatic syringes, the teach pendant, IO cable, and Syringe mount. Requires 1 regulated compressed air supply line, up to 100psi max, and 115V or 230V power supply to function.​ 200MM ​x 200MM x 50MM (Height) movement. Availability: 4 week build time. Need multiple units? Contact IDS directly for a quote. If you have never used this system with your material, be sure to speak with an IDS employee before ordering to confirm the compatibility. 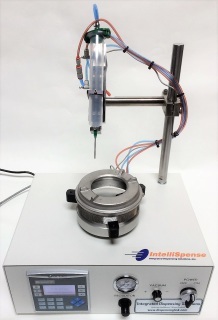 Includes the 5552202 - Dispensing Robot - Micro stepping 3-Phase motor, Analog pneumatic syringe dispenser that works with 30cc or 55cc pneumatic syringes, the teach pendant, IO cable, and Syringe mount. Requires 1 regulated compressed air supply line, up to 100psi max, and 115V or 230V power supply to function.​ 300MM ​x 300MM x 100MM (Height) movement. 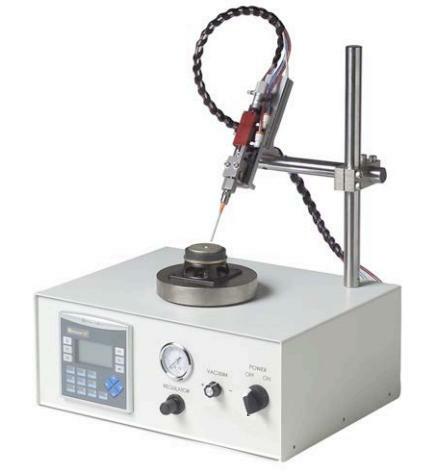 Includes the 6111118 Rotary Table Dispense System with Z axis slide mounted pneumatic syringe holder that works with 30cc or 55cc pneumatic syringes. Requires 1 regulated compressed air line, up to 100psi, 115V or 230V power supply. Intended for entry level dispensing. If this is a new application, or you have never used a system like this before we suggest contacting IDS directly to discuss your options. Availability: 4-8 week build time. Need multiple units? Contact IDS directly for a quote. 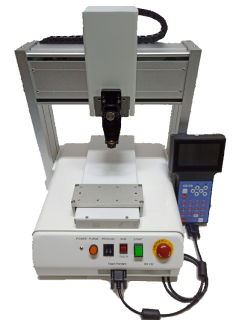 If you have never used this system with your material, be sure to speak with an IDS employee before ordering to confirm the compatibility. 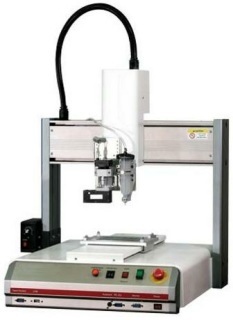 Includes the 6111118 Rotary Table Dispense System with Z axis slide mounted Front Closing valve and built in valve controller with 2 liter reservoir. contains all lines within system. Requires 1 regulated clean compressed air line, up to 100psi, and 115V or 230V power supply. Intended for entry level dispensing. If this is a new application, or you have never used a system like this before we suggest contacting IDS directly to discuss your options. Includes the 6111117 Dual Rotary Table Dispense System with Z axis slide mounted pneumatic syringe holder that works with 30cc or 55cc pneumatic syringes. Requires 1 regulated compressed air line, up to 100psi, 115V or 230V power supply. Intended for entry level dispensing. If this is a new application, or you have never used a system like this before we suggest contacting IDS directly to discuss your options. ​SHIPPING COST INCLUDED IN PRICE - anywhere in the Continental USA that can receive loading dock shipments. Includes the 5553200 Over-belt Dispensing Robot - 7.8” x 7.8” (200 x 200mm). Includes Pneumatic Syringe Dispenser, IO cable, and syringe mount. Intended for use with some conveyor systems or for desktop use. Perfect for any application where you want the part to stay still and have all of the motion done above the work area. For use with PLCs, indexing stations, or fit in any work cell. Interface for IO connections on the control box for external control. Includes the 6111117 Dual Rotary Table Dispense System with Z axis slide mounted Front Closing valve with micrometer and built in valve controller with 2 liter reservoir for each valve. Contains all air and material lines within system. Requires 1 regulated clean compressed air line, up to 100psi, and 115V or 230V power supply. Intended for entry level dispensing. If this is a new application, or you have never used a system like this before we suggest contacting IDS directly to discuss your options.